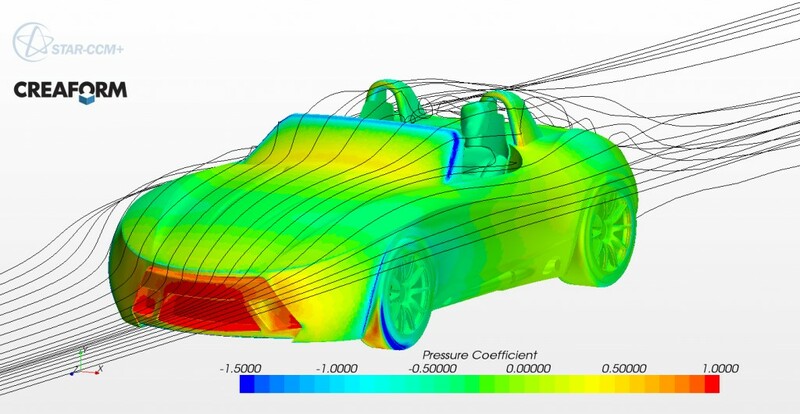 I was looking through my latest Autoweek magazine and saw a Chevrolet ad touting their extensive use of Computational Fluid Dynamics when designing their latest Corvette. We did too! 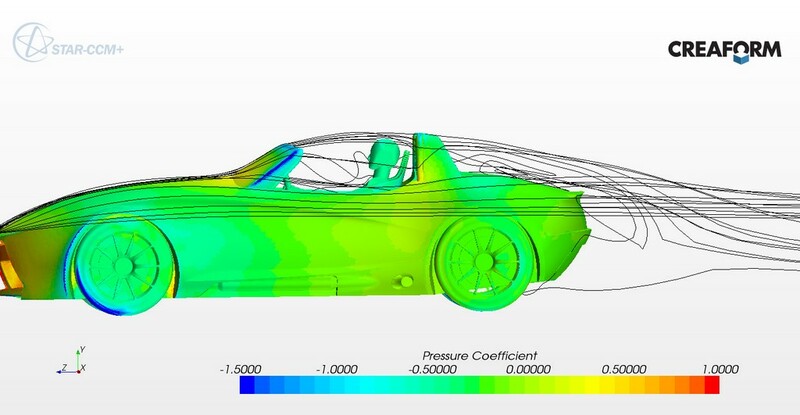 Included are some new CFD displays that show just how disruptive a windshield can be to aerodynamics. The following images are one reason why our track cars race sans windscreen, and why we’re developing a hard tonneau for the passenger side. 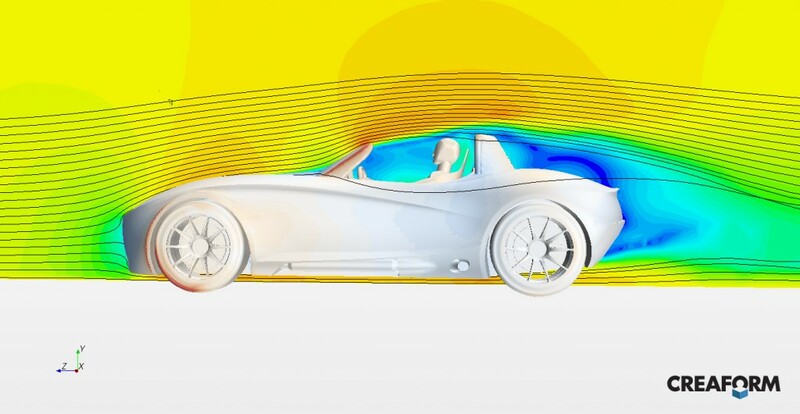 An interesting solution to the aerodynamic turbulence problem you have may be found in a solution used by Donal Healey in the Austin Healy 100/4. This now vintage car had an interesting lay down windshield. Within the windshield post on both sides was concealed a relativly simple linkage mechanism that allow the windscreen to have two positions. Donald had the windshield fold so that they could achieve the 100 MPH speed they were named for with the relatively small, low power engine. Unlike the Willy’s Jeep that just folded forward face down out of the way. Donald had the base of the windshield rotate forward over the windshield wipers and set forward on the front cowl, at the same time the top of the screen came down low and rearward. The whole idea was to use the same windshield for a upright civilized (had a roadster top), and a low folded down weekend racer/speedster position. The Catfish has allot of that vintage look around the cockpit. That is because the 50’s and 60’s sports cars had the hood, fender, and cowl lines all ran through the whole car to the cockpit opening, and the windscreens were typically placed over the body work not up though like the modern cars. Of course these old vintage sports cars also had side curtains, leaky tops, and little safety and convienence we take for granted today. To fold the windshield there was a Knurled knob on each side that locked the windshield in the upright position. When released on both sides the windscreen could be lifted. The windshield post on both sides was made up of a fixed lower part and a moveable upper part. The two had a single hinged link connect the two. The moveable upper part of the screen had a pin in both sides that came out of the fixed lower screen post that stayed in place on the car body. moveable upper part of the screen could then be repositioned into another “foot” anchor part mounted forward on the body that again has a hole for the post. The movable part had a spring that attached along to the upper part and to the fixed lower screen post keeping tension on the post and keeping it in place when rested forward. There was a larger external weather seal that sealed the base of the screen in both positions.